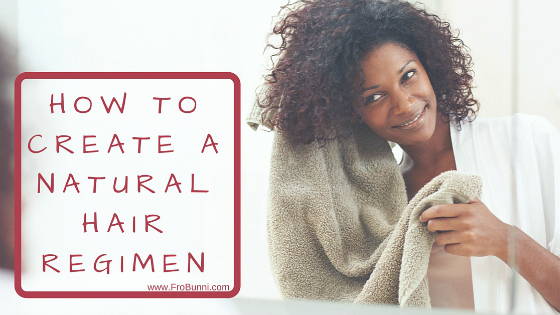 FroBunni: Dear FroBunni: How do I create a natural hair regimen? 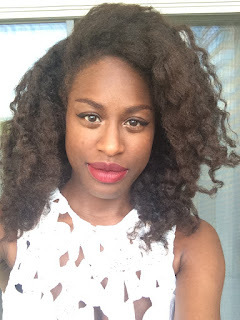 Dear FroBunni: How do I create a natural hair regimen? Dear FroBunni, I've been natural for a couple years now, but I've never actually put together a hair care regimen for myself. To be honest, I don't even know where to start. Creating a regimen is actually pretty easy. The difficult part is tweaking it to fit your specific needs and finding hair products that work best for you, But for the sake of keeping this post on topic and for brevity, I will just focus on creating a regimen. A natural hair regimen has two main parts, wash day and daily maintenance. At the most basic level, a wash day will consist of washing and conditioning...of course, most naturals do more than this. Instead of using shampoos, some naturals will cowash, or use conditioners or a cleansing conditioner, to cleanse their hair (this is currently what I am doing with Herbal Essence Naked Cleansing Conditioner). After shampooing, conditioner follows (this step isn't necessary with cowashing). The amount of times you will wash will be up to you. I wash once a week, some naturals wash every other week, and other naturals wash once a month. Ideally, on wash day you should detangle. There are many ways to detangle - you can use a wide tooth comb, a denman brush, or even your fingers. Make sure to be gentle, and it is easier to detangle with conditioner in your hair. I generally detangle with a denman, but if I am doing a wash n go, I will detangle with my fingers (it keeps my curls clumped and defined). Deep conditioning is optional, but if you have issues retaining moisture, it is wise to do it once a week. Try to find a moisturizing deep conditioner, meaning it has little to no protein in it. You can also deep condition with a protein conditioner, like ApHogee, if your hair is brittle or breaking off. I deep condition with a moisturizing conditioner whenever I feel like it (I have no set schedule), and I use ApHogee 2 Minute Reconstructor once a month to strengthen my ends. After all that, you will want to style your hair, but before you do, make sure to use a leave-in conditioner and seal with an oil or butter. The leave-in conditioner will give your hair added moisture and the oil or butter will seal it in. Below I listed some oils and butters that you can purchase from hair care companies, but you can also use oils and butters like olive oil, coconut oil, sweet almond oil, shea butter, aloe vera butter, sunflower oil, etc. Oh yeah, and this is important to note, oils and butters are not moisturizers. I see this all the time in natural hair groups and forums; the only way to moisturize your hair is with water (or aloe vera juice), so if water isn't the first or second ingredient in the ingredient list, then it won't moisturize your hair. Since oils and butters have NO water in them, they are not moisturizing. They seal, but they don't moisturize. And finally, styling. Natural hair is not limiting, so feel free to experiment with anything. Wash n gos, braids, twists, flat twists, braid outs, bantu knots, twist outs, puff, perm rod sets, sponge roller sets, regular roller sets, blowouts. The list goes on and on. Ok, so wash day is done; now for daily maintenance. While wash day is very much up to the individual, daily maintenance is even more so. Most of the time, daily maintenance for me consists of moisturizing, sealing, and resetting my style every night (I am noticing that the Jane Carter Wrap and Roll extends the life of my roller sets an extra day, which is awesome), and in the morning, I take out whatever I put in my hair (braids, twists, rollers, etc.) and run some Giovanni Ultra Sleek Hair & Body Super Potion through my hair to prevent frizz. I do this because my hair needs to be moisturized daily and I can barely get second day hair. For other naturals, my daily maintenance is too much. They will prep and set their style for wash day, and that's all. They'll wear a braid out or twist or blowout for the entire week, and pineapple their hair at night to preserve the hairstyle. For other naturals, they will moisturize, seal, and restyle their hair every 4 days. It really depends on the person, their time commitment to their hair, and what their hair needs. So that's it. Fairly simple. Like I said, creating the regimen is simple, but it's finding the right products and techniques that will give you trouble. But again that's another post for another day. I put together a product list of shampoos, cleansing conditioners, conditioners, deep conditioners, leave-ins, sealing butters and oils, and gels and creams to get you started on finding the perfect products for you! Yoga Challenge Starts This Week! Natural Hair Gels and Curling Custards to try!